Ask a local what comes to mind when they think of Sackets Harbor and you are likely to hear the following: quaint, historic village, unique shops, amazing restaurants, the Comedy Club, summer concerts and the Battlefield. Walking down Main Street in Sackets Harbor is like taking a step back in time. 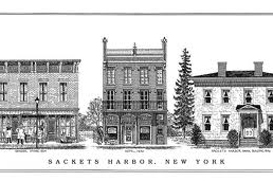 Take time to notice the homes and commercial buildings that line the streets; loving cared for, most of these buildings date back to the 1800’s and early 1900’s and comprise the Sackets Harbor Village Historic District which is listed on the National Register of Historic Places. Tin Pan Galley is noted for the best breakfast around; during the summer months you can dine outside in the courtyard. Inside you will love the cozy atmosphere. If you just want a cup of coffee and a pastry go across the street to Chrissy Beanz, the aroma will draw you in. Want a fresh brewed beer? Try the Sackets Harbor Brewing Company for a nice meal and a wonderful selection of Craft Beers. After a nice meal, stroll over to the Lake Ontario Playhouse for a night of comedy. History buffs will want to visit the Historical Society and the Sackets Harbor Battlefield Historic Site. Here you can tour a few buildings and get a feel for life in the 1800’s. If you time it right you might see a re-enactment of a battle from the War of 1812. If swimming is more your style, be sure to check out Westcott Beach State Park, great for a day trip or a week of camping. The little ones will love Old McDonalds Farm where they can go on a hay ride and see farm animals up close. The adults will want to stop in at the Yellow Barn Winery which is part of the Thousand Islands – Seaway Wine Trail. Young and old, there is plenty to do in this charming little lakeside town. Sackets Harbor Central School is located on South Broad Street right in the village. Grades 1 through 12 area all located in the same building. The younger grades are on the first floor with the older students having classes on the second floor. You children can participate in soccer, baseball and basketball. If you want to explore life in a small town atmosphere Sackets Harbor has many homes to choose from. Homes range from simple ranch homes to luxurious new homes to classic and historic homes. Sackets Harbor, something for everyone.